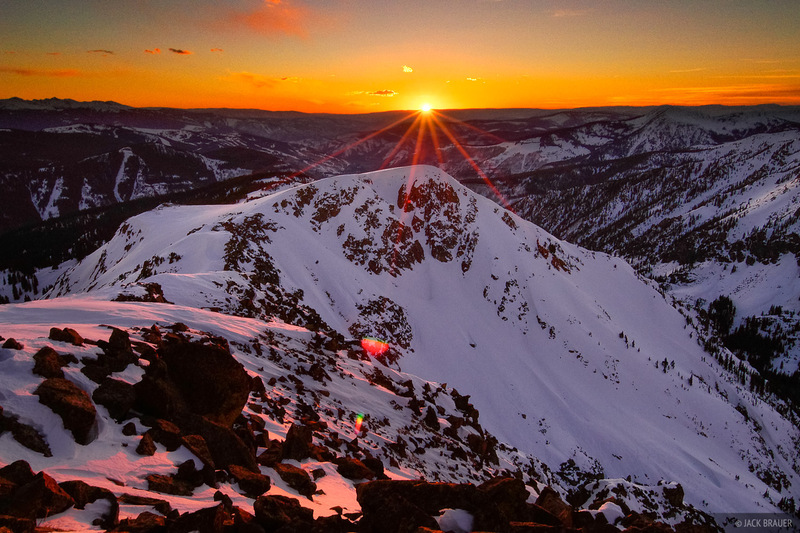 Sunset over Vail valley from high in the Gore Range, Eagles Nest Wilderness. On this evening in March, I took advantage of unseasonally warm weather by camping up high above treeline. During some tricky routefinding through the snowpacked forest I inadvertantly started hiking up a broad ridgeline instead of up the valley to a lake where I originally intended to spend the night. It turned out great though, as I found a nice campspot along the ridge, sheltered by a huge winddrift. Spending the night high on a snowy mountainside with beautiful weather and endless views is a rare treat. Photo © copyright by Jack Brauer.